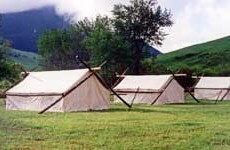 The Mountain Man Wall Tent is a basic tent with no modern hardware. These tents are made particularly for rendezvous and reenactment enthusiasts. The eaves have brass grommets, the door overlaps and has canvas ties on the inside and out to secure the door. Cotton stake loops are standard. Wood stakes, rope tighteners, rope and carrying bag are also included. Poles are not included.